I’ve been working on sewing down the binding on the Strip-pieced Lone Star/Star of Bethlehem quilt over lunch this week while watching episodes of Eureka on Hulu, and thought I’d take a break from that today to review the batting I used on the quilt: Pellon Nature’s Touch Cotton Batting. 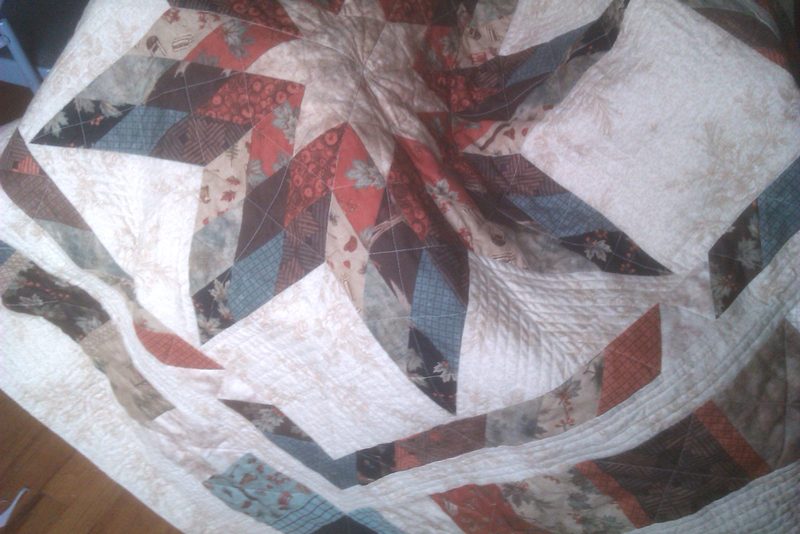 This is the second quilt I’ve used this batting with, and there will be many more. It’s 100% cotton, so it gives that nice crinkly effect when washed. 3-5% shrinkage is to be expected, like most other mostly-cotton battings, but it can be preshrunk if desired. It’s needle-punched with a scrim binder, which allows you to space stitching up to 8-10″ apart. There wasn’t any bearding while I was quilting—not even when finishing the binding, which I’ve experienced with other cotton battings. It claims to have a ¼″ loft, but it seems a bit closer in weight/loft to the 1⁄8″ loft battings I’ve used in the past. That said, it is a wonderful weight for a nice all-season quilt—pretty much the perfect loft for just about everything I like to make. The weight/loft was nice and consistent with no transparent sections like I’ve seen in similar-loft battings like Cream Rose. 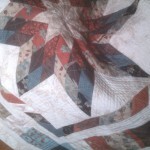 I quilted all the beige areas in straight lines about .5″ apart, while the more colorful areas are less densely quilted. It still drapes wonderfully, without any stiffness. The Synchronized Squares quilt was quilted with large 4″ open squares, and much of the quilt top was actually double-thickness fabric, so it was far heavier, but still had the wonderfully fluid draping action going on. I bought mine from JoAnn Fabric by-the-yard—it comes in 90″-wide bolts, so you’re not going to be able to do anything larger than a standard Queen without piecing. From what I can tell, if you’re looking for prepackaged cuts, it only comes in Queen-sized, which is the standard 90″×108″. It’s relatively new, from my understanding. In fact, Pellon hasn’t yet put any information about it on their website, which sounds like someone dropped the ball in their Marcom department. As for pricing, it comes in a bit cheaper Warm & Natural/White, which is what led me to try it in the first place. My local JoAnn sells it for $10.99/yd (and of course you can always find 40% or 50% coupons, not to mention that they have 40% sales on batting regularly anyhow). The queen packaging is actually slightly cheaper than buying the three yards by-the-yard—it retails for $29.99 and again, coupons/sales generally apply. So, short answer at the end of the post: it’s wonderful, has become my go-to batting for just about anything (unless I want to splurge on Bamboo/Cotton, which is still my favorite so far), and I recommend trying it at least once in your own projects. Have you tried it? What is your go-to batting? I’m always looking to try others out. It’s amazing how one batting (or thread, etc) will give a completely different experience in a different machine. Thank you for pointing out that when I review batting, I should make sure to note if I FMQed or just straight-line quilted. That can make a big difference, and I’ve only straight-line quilted with it so far. 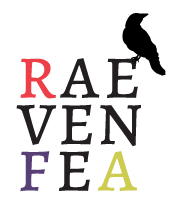 I’m going to use it in a FMQ project soon, so I’ll update then. I’m sorry you had such a bad experience. I like trying new battings, but sometimes it’s good to stick with what you know works. I love this batting. Also purchased it at Jo-Ann’s (not sure that it is sold anywhere else) to use on some baby quilts, having been disappointed in Cream Rose. I have used it on half a dozen quilts both on my long arm and my sewing machine and have experienced no problems. I’ve not seen the “bird’s nest” situation, but then I never use the auto thread cutter when quilting. It is definitely not 1/4 ” loft, but I would use two layers if I wanted something with more body. FYI, this batting is sold online at Walmart for less than $4 a yard. I was searching for reviews before I bought. I like 80/20 the best because I do not like the bumpy look on my contemporary quilts. I will LYK how I like it. I’ve used their 80/20 blend a few times with great results, too. Thanks for the heads up on the Walmart source! I’m always up for saving money on batting when possible, especially since I’ve pretty much run out of scraps I can piece together now, too. I was very disappointed with this batting. Very thin in spots – you can see my backing through it. I really don’t want to use it in my quilt that I have spent so much time piecing.